The chance to build your professional learning network and find inspiration by networking with fellow attendees, including educators, philanthropists, thought leaders, and policymakers. 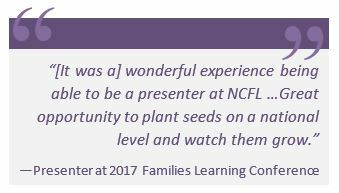 The Families Learning Conference is such a valuable event for educators, family literacy staff, administrators, and community-based organization staff because of our unique focus on engaging all members of the family. 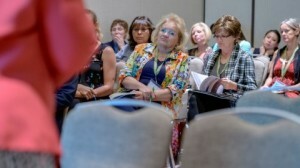 This focus equips attendees with education solutions to issues commonly encountered while working with under-served families; practical ideas to take back and use right away in the classroom; and ideas for community-based partnerships to broaden the impact of attendees' work. We've established six strands of educational content, making it easy for attendees to build their schedules. These strands include topics that focus on: Adult Education, American Indian/Alaskan Native, Early Childhood Education, English Learners, Research and Policy, and Two-Generation Learning. Read more about topics within these strands by clicking here. The Call for Proposals closes in two weeks. Start your application today!